Placa del Rei in Barri Gotic quarter is one of the oldest squares in Barcelona. It is formed and surrounded by medieval king’s palace – Palau Reial Major. The big stair in the centre is still remember Christopher Columbus footsteps. I went to this square after blue hour photo shoot in front of Barcelona Cathedral and I was lucky to find a big puddle here left from the yesterday’s rain. 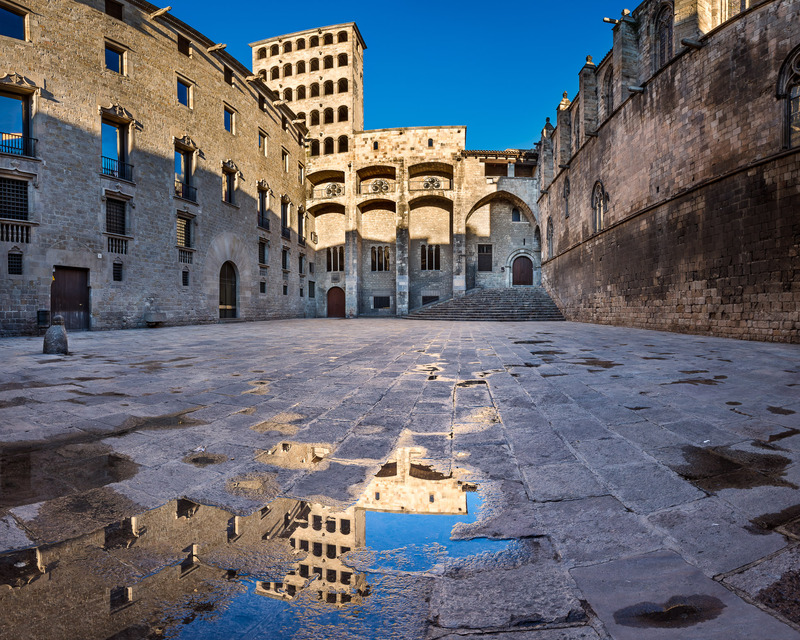 I chose panoramic composition to show more of the square and carefully included Palau Reial Major reflection in the puddle. Panorama from 2 vertical images, additional exposures for highlights, focal length 16mm, aperture f/11, shutter speed 1/13, ISO 100, tripod, pano head. This entry was posted in City and tagged Barcelona, Catalonia, Spain.